"Evelyn Laurette Lamb, Westbrook College, Class of 1978"
Westbrook College student Evelyn Laurette Lamb, Class of 1978, was a Fashion Merchandising major and a Day Hop. 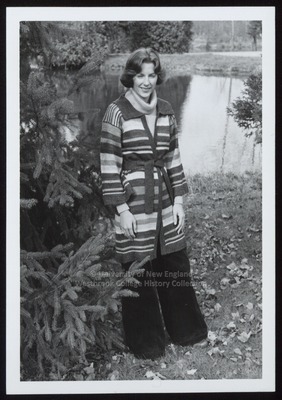 For her senior class candid photo, which appeared in the 1978 Tower Yearbook, she wore dark, bell-bottom slacks with a light-colored turtle neck jersey and bold striped coat sweater. Her hair was parted in the middle and feathered back. Evelyn poses before an evergreen tree near the duck pond in Evergreen Cemetery.